Our Open Exhibits multitouch software initiative has just completed its first year. Last year, we received funding from the National Science Foundation and we launched our full community site last November. We’ve learned a lot in year one and we are gearing up for an exciting second year. The Heist project was announced today. Heist is an experimental project that uses Open Exhibits and GestureWorks software and is powered by Sensus server technology to enable effortless networking. It allows museum visitors to “steal” digital objects; easily placing them on their smart phones or tablets. The system uses a captive WiFi portal to push an HTML5 app to visitors so there is no need to download an iOS or Android app. The visitor just connects to WiFi and opens their browser. We are planning a testbed with ten museums this winter. Learn more and check out a video of Heist. Open Exhibits is on the road in October and November. There are presentations and workshops planned on both coasts and in Europe. We’ll be at Association of Science- Technology Center’s (ASTC) annual conference in Baltimore, the British Museum in London, and at The Tech Museum in San Jose. 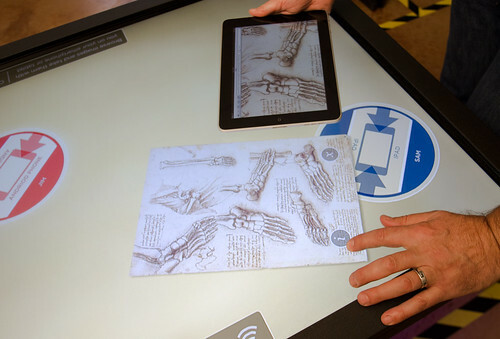 We will have one of our MT55 Platform Multitouch Tables at the British Museum if you want to check it out. 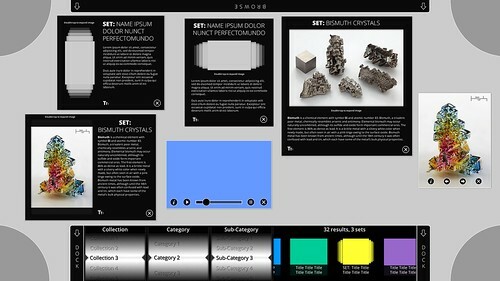 Work has begun on a new version of our most downloaded software module, the multitouch-enabled Collection Viewer. We’ve posted preliminary designs and have explained the new features that will become available in the new version. Open Exhibits surpassed 10,000 software downloads last month and our community now has over 1,700 members. If you haven’t already done so, please join us. We are looking forward to an eventful second year. Category: Android, Design, Exhibits, Experimental Applications, Flash, Gesture Works, Multi-touch, Multitouch, Museums.